There's the odd occasion when big isn't necessarily better. It's a funny thing about New Zealanders that we can be slow to recognise our own excellence. The Osprey range of alloy pontoon boats are perfect for the sort of person who is reluctant to compromise. A small, versatile and multi optioned craft can often be the one that ends up being simply the most fun. 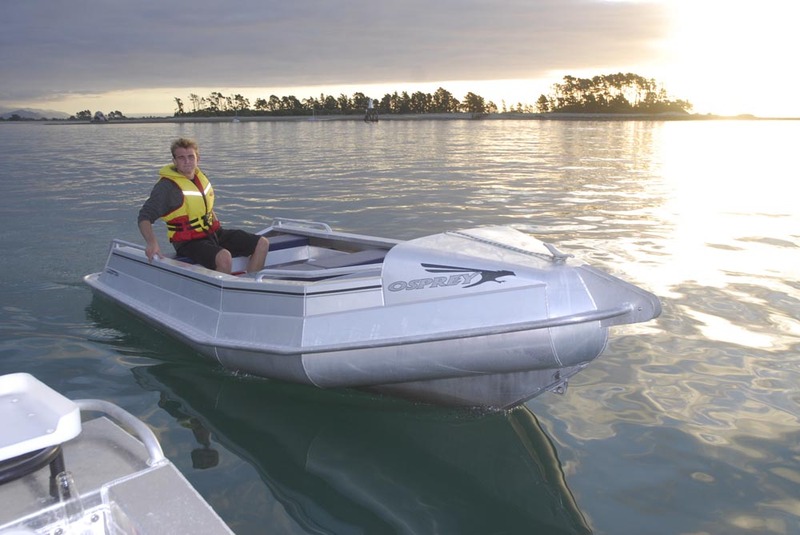 The Osprette range encompasses three different sizes of boat, from 4.0 metres in length to 5.0 metres. Built, as are all our boats, from tough, Marine Grade aluminium, they come with a choice of different internal layouts to suit your use and requirements. It may be small you are after. But you will be pleased to note that the list of standard and optional features on this range is reassuringly large. The Osprette range of our aluminium pontoon boats have 4 configurations ranging from the affordable dinghy for the kids knowing that safety is paramount to the beginning of the serious fishing boat range with rod holders galore. All models are ideal for the Dad and kids fishing with storage, seating and stability you will ever need. Click here to view our brochure online, or click here to download a pdf version. Our entry level pontoon boat to get you started, or an affordable dinghy for the kids knowing that safety is paramount. Perfect for fishing in the estuary alone or trolling on the lake for that big trout. Very basic design but still with the big Osprey reputation. Same hull as our entry model but with high sides, twin seats with squabs, rod holders and more storage. She's ideal for Dad and the kids fishing, or for a small family picnic on one of those out of the way beaches. Same hull & sides as our S model but console either central or to one side. Bow rail extending back to the console and ice bin for the seat. With remotes & steering it has the feel of a much larger craft, perfect for the set line or flounder netting. So easy for 1 person to handle alone. Want to head out that little bit further with your fishing buddy and the kids? The 450S is the ideal 'BIG' dinghy with all the seating, storage and stability you'll ever need. Coupled with a 40hp on the back and you will be at your destination in no time. Ski or biscuit back to the ramp. The BIG little console boat, get out amongst the kingi’s trolling or towing the dredge for a fresh feed of scallops. With a couple of mates on board the 450 console series is the perfect vessel to get out there on a modest budget. With plenty of storage in the side pockets and the addition of a bait station just screams take me fishing! Coupled with a 40hp on the back and you will be at your destination in no time. All you could ask for in a 5.0M boat with choice of either centre or side console, hydraulic steering and room on the dash for all your electronic gizmo's. This is the beginning of the serious fishing boat range with rod holders galore, bow rail extending back to the console and ice bin for the seat. Plenty of storage, ideal for bringing back the catch in prime condition.